For this emergency room nurse, getting back to work was job one. Becky Griffin is back to work, following DIEP flap reconstructive surgery. Becky Griffin was working 36 to 48 hours a week as an emergency room nurse. She’d spent over twenty years in rural emergency rooms and was working for two hospitals, one in her hometown of Baxley, Georgia and the other thirty miles away in Vidalia. In November of 2010, however, she received her diagnosis—she had breast cancer—and all of a sudden she had to start thinking about herself. Becky was referred by her hometown physician to the Nancy N. and J.C. Lewis Cancer & Research Pavilion at St. Joseph’s/Candler. As always in these situations, there was only one thing on her mind—she had breast cancer. Everything else was TBD, requiring a series of choices she wasn’t necessarily ready to make. Nevertheless, with the help of Dr. Howard Zaren, she chose a clear course of action that would make her whole. 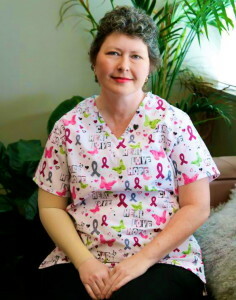 Ultimately, Becky Griffin opted for a bilateral mastectomy, followed by postoperative chemotherapy and bilateral DIEP reconstruction, as performed by Dr. Cliff Cannon of Cannon Plastic & Reconstructive Surgery. For years, the TRAM flap has been the standard of care, replacing sacrificed breast tissue with skin, fat, and muscle taken from the abdomen. More recent advances in micro-surgical technologies have given doctors another, more attractive option: the DIEP flap. Now available to women in Savannah, the DIEP flap technique leaves the abdominal muscles intact, borrowing skin and flesh only in the creation of a new, living breast. On January 1, 2011, Dr. Howard Zaren performed Becky’s bi-lateral mastectomy, which was followed by Dr. Cannon inserting tissue expanders in order to maintain the skin pocket and preserve the infra-mammary crease (the fold underneath the breast) for eventual reconstruction. Thus began her road to recovery—a road that would take her from one hospital in Savannah back to her job in the Appling HealthCare System. Becky would have to wait a year for reconstruction as she endured a second surgery in order to remove a cancerous lymph node that was discovered in her underarm. She started her first round of chemo in March, therapy which she continued through September. Next, she had to build up her strength and gain some weight in her belly in order to provide ample tissue for the DIEP flap reconstruction.